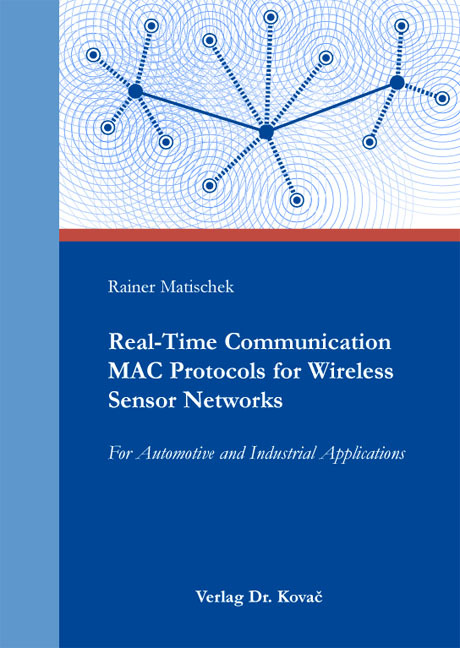 Real-Time Communication MAC Protocols for Wireless Sensor Networks. Doktorarbeit von Rainer Matischek, Verlag Dr. Kovač 2012, 230 S.
The ongoing integration and miniaturization of computing and wireless communication devices has enabled a multitude of new applications. While the most obvious example of the advance of the last few years is the mobile phone, another promising wireless application is emerging from a recent field of research, „Wireless Sensor Networks“ (WSN). These networks comply with the idea of ubiquitous computing by integrating distributed computing devices into the environment, where they perform specialized or distributed tasks, while remaining partly invisible to the user. In recent research a vast number of communication protocols for such WSNs have been developed. While previous research was primarily focused on power awareness, some more recent research have begun to consider a wider range of aspects, such as reliability or real-time capabilities. Following this, an essential part of this book is dedicated to the further development of these new aspects, but in contrast to previous research this book is focused on future applications in automotive and related industrial scenarios. The first portion of this book provides an insight into automotive sensor applications and common wire-based fieldbus communication systems in comparison to existing WSN protocols. This part also compares various real-time optimizations of state-of-the-art WSN-„Medium Access Control“ (MAC) protocols and discusses their applicability and limitations for a potential (exemplary) application scenario using a WSN in a car. The second portion deals with the design of a novel real-time capable wireless MAC protocol with higher robustness against intra-network interferences that are expected in a densely-deployed automotive WSN or in related industrial scenarios. Furthermore, the extension of the real-time MAC protocol for efficient routing in a hybrid wireless/wire-based network topology is presented. Finally, a special WSN-simulation-framework is used to evaluate and discuss the performance of the proposed concept.